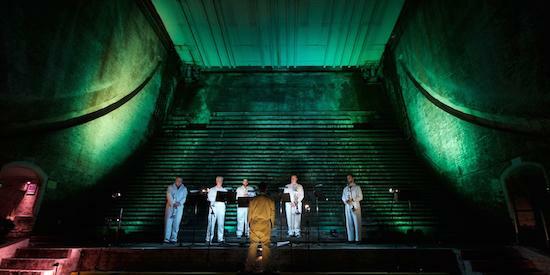 Following a series of concerts in the Bascule Chamber at Tower Bridge last year, composer Iain Chambers has once again assembled a programme of events for this weekend (September 22-24). This year's concerts showcase three new works, as well as specially commissioned spoken word performances and a sound walk exploring the chamber at Tower Bridge. Featured in the programme is a response to Handel's Water Music by Langham Research Centre, which will be performed 300 years after Handel’s work was premiered on the Thames. The performance will see the LRC 'play' the sound of the Bridge's river and road traffic live, using hydrophones in the river and contact microphones on Tower Bridge itself. Clarinettist Kate Romano will perform alongside Langham Research Centre in a new composition for oscillators and clarinet, while she will also perform Steve Reich's New York Counterpoint. Franco-Cameroonian singer Coco Mbassi will perform a new work in the Bridge's Accumulator Chamber, imagining the conversations happening on board boats carrying immigrants, while poet Kayo Chingonyi will create and perform new spoken word especially for the space. You can find out more information and get the last tickets for the weekend's events here.